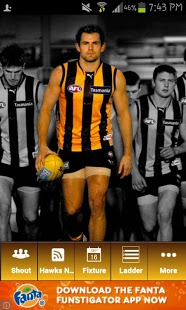 If you only download one Hawthorn app this season it has to be this one presented by LarNoa Media. PLUS, for those who like to have a bit of a punt on the footy (and who doesn’t?) we have also included a “punters” section where we have taken the Twitter feed for @AFLPicks for his weekly picks against the line (with permission of course!). 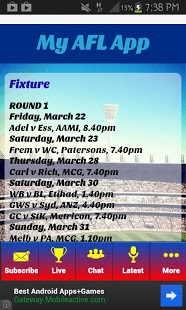 We have also included the sportsbet.com.au website for all the latest odds for everything AFL. And if that isn’t enough we have included a “Shout” page where you can engage with fellow Hawks supporters and maybe even the great man himself Alistair Clarkson who we are certain has this app downloaded to his Android device. 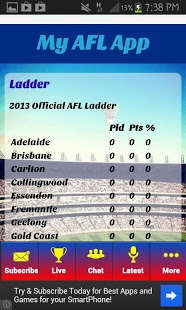 So forget about all those other unofficial Hawthorn apps developed by overseas developers with their use of “Schedules” and “Standings” This is a real Hawks app developed by true lovers of AFL Football. We have even included links to the official Hawthorn mobile site and Google Play application because we are not here to compete with the Hawks, we are merely here to add extra value to the “fan” experience. The official app has some great video, profiles and stats and should be an integral member of your app collection. This Hawthorn Hawks application is currently only available via the Google Play store so all your iphone friends will be left saying ïWant and iJealous! Please provide honest and constructive feedback for our developers. We are always striving to put provide a better user experience with our applications so your input is greatly appreciated and respected.